Playing cards can be used for charity purpose. I have selected this pack published by Theory 11 in 2012 because it is still available and I like the illustrations made by Hatch Design of San Francisco. This pack of 54 cards is the outcome of the collaboration with the World Wildlife Fund (WWF) and it is still available from the editor’s web site and other ones. The Spades are dedicated to the Arctic, Hearts to the Grassland, Diamonds to the Jungle and Clubs to the Swamp. 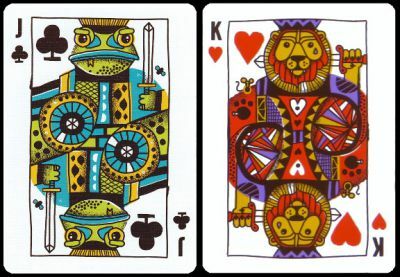 The pip cards are alas not illustrated. Price and where to find: US$ 10 from store.theory11.com, and uncut sheets are still available for US$ 30 each.